I had never heard of the small Portuguese town of Mateus, but when we realized we needed to break up our trip from Guimaraes to Braganza, we looked at the map and saw that Mateus was conveniently located around the mid-point. 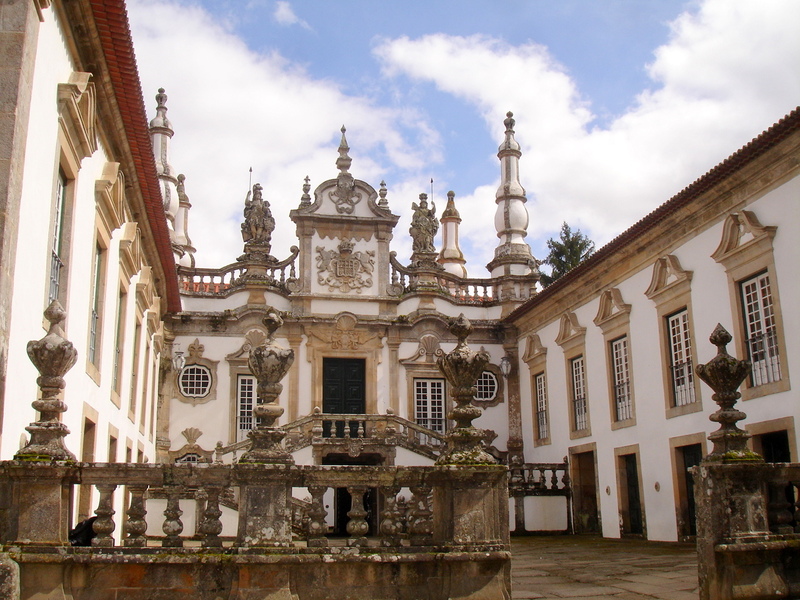 The Casa Mateus, an early 18th century baroque manor house built by the Mateus family (makers of Mateus rose wine) is now open to the public and run as a private foundation by the Mateus family. 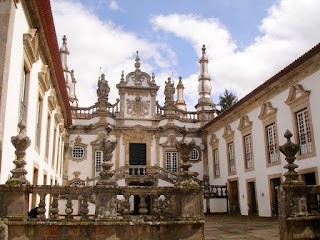 The manor house was filled with the art work/memorabilia of the Mateus family and definitely worth a visit. But for me the great attraction was the garden—I cannot resist a garden tour. 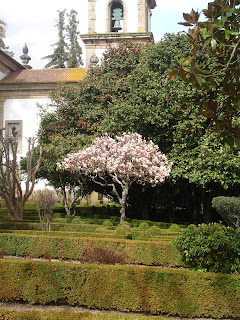 The garden was awash in camellias, magnolias, and apple trees in bloom. 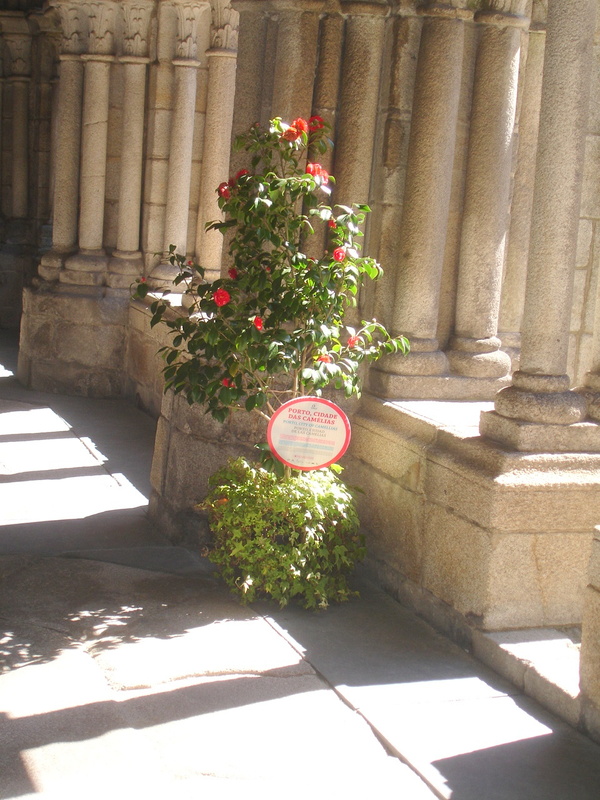 In fact camellias were everywhere in northern Portugal. The Casa Mateus garden was not as well kept up as it might be—we were told there was only one full-time gardener with 2 part-time helpers—but was still very beautiful and must be spectacular in summer. Although we greatly enjoy the absence of crowds and the low prices of off-season travel, the reality is that gardens are generally at their best during high season. Again, trade-offs, trade-offs. Braganza turned out to be something of a disappointment. It does have a well-preserved 12thc. 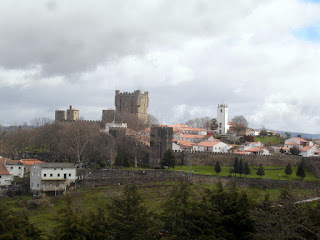 castle on a steep hill with spectacular views of the countryside, but outside the castle walls the town is mostly modern construction, without the architectural riches of most of Portugal’s historic towns. Apparently the Braganca dynasty which built the castle decided to leave the cool rainy North and decamp for the warmth and sunshine of Southern Portugal and took their enormous wealth with them. Our trip was winding down and I was starting to get tired. Two weeks is about my limit at this stage of life and this trip was over the limit. Much as I enjoyed our road trip in Northern Portugal, I was starting to think longingly of home. When we were younger we took this kind of European road trip for 3-4 weeks and if money had not been an issue would gladly have kept going for another 4 weeks. But, sad to say, this is no longer the case. 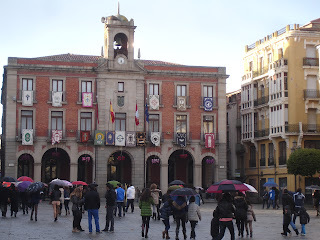 If we ever travel to northern Portugal again, we will definitely plan an overnight stay in the magical town of Viana do Castelo which has a glorious old town and one of the most beautiful town squares in Northern Portugal. When Rick and I first started traveling together we never made advance reservations. We waited until we got to a town before deciding whether or not we wanted to stay there, but as we got older we increasingly disliked the hassle of searching for a hotel. So we now we choose the security of advance booking over the freedom to follow our inclinations. We’re just too old to arrive in a town dead tired without a hotel booking. We also have less tolerance for changing hotels every night. So although we would have liked to stay in Viana do Castelo, we had already booked two nights in a fantastic pousada in Guimaraes, a converted 12th century monastery perched on a steep hillside with magnificent views and a glorious garden. 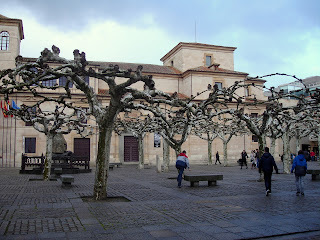 It even had a beautiful cloister where guests could hang out. I had always wanted to sit round drinking wine in a medieval cloister—yes this really has been one of my travel fantasies—and in the Pousada de Santa Marinha da Costa I got my wish. The next day we went to the Bom de Jesus do Monte described by our guidebook as “Portugal’s most spectacular religious sanctuary." 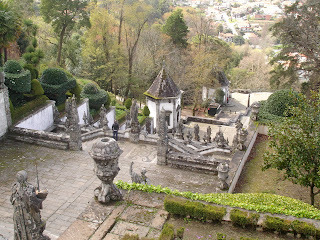 Bom Jesus with its spectacular baroque staircase leading up to the church is itself worth a trip to northern Portugal. Rick and I surprised ourselves by managing to climb up and down the astonishing staircase. It was gratifying to know we could still do something like that. The only disappointment was that the white washed stone of the staircase was beginning to show some wear and tear and looked very different from the photo in the guidebook. 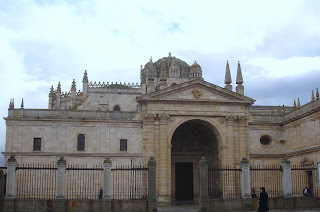 Portugal is clearly having difficulty keeping maintaining its rich cultural heritage. 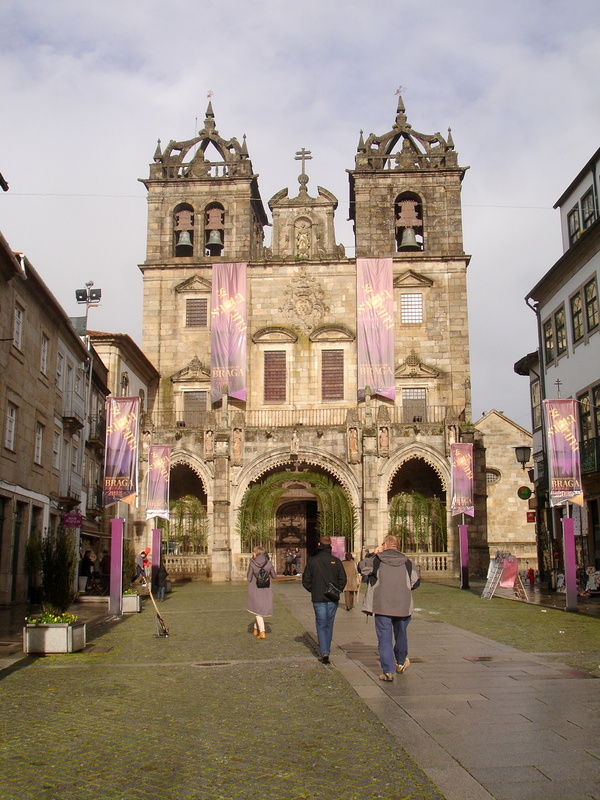 Unfortunately, we short-changed Guimares with its attractive old town and impressive Main Square, but we did manage to explore the historic center of nearby Braga. Rick and I have accepted that we can't see everything and would rather see a few things well than run frantically from place to place. Most of Braga is a little shabby, but once you enter the old town, it’s a magical place. 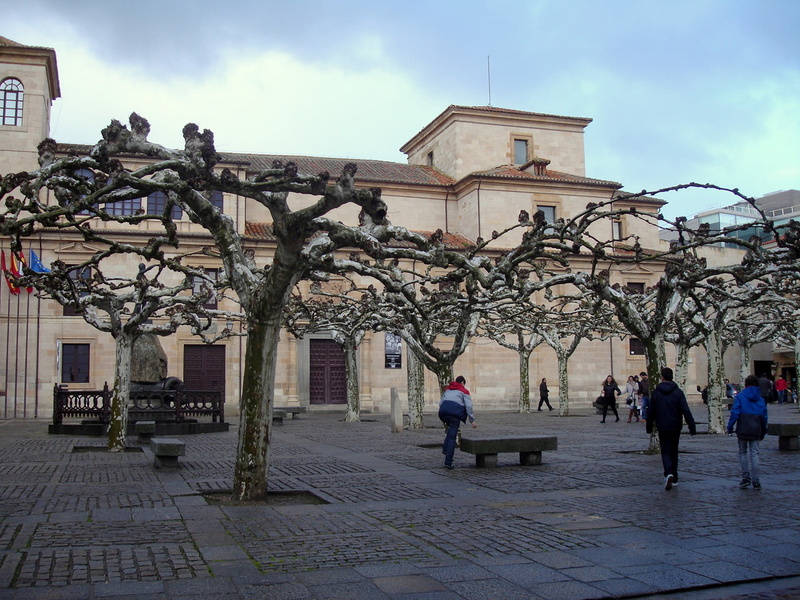 Unfortunately, getting to that historic center is a herculean challenge. These ancient European cities were not meant for automobiles. Once inside the old town, we were really happy we didn’t give into our frustration with the crazy traffic and near impossibility of finding a parking space and abandon Braga. 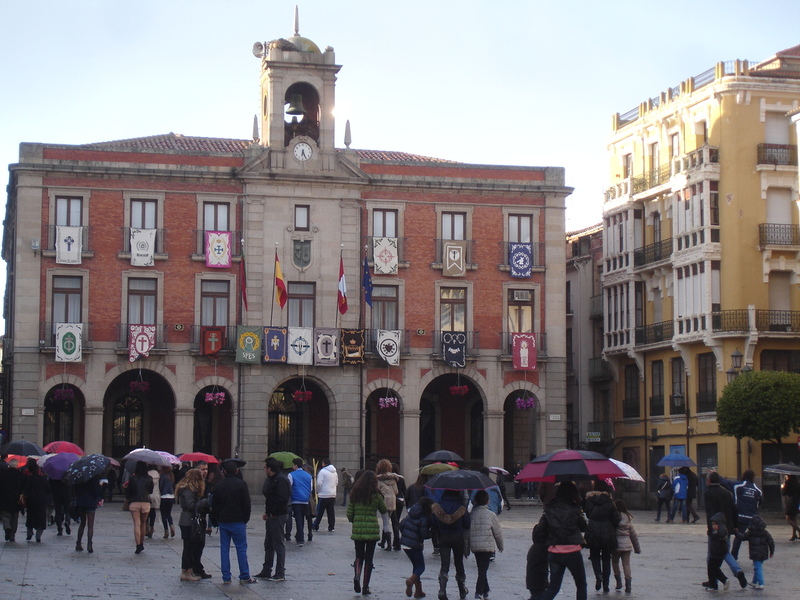 But even in the generally well-kept old town, there were signs of disrepair and historic buildings which sadly no longer looked at all like their photos in the guidebook. 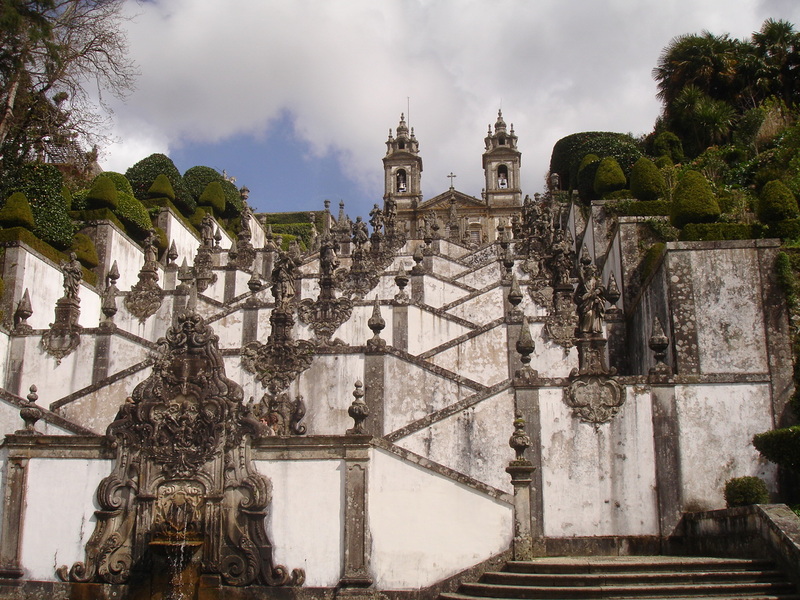 Let’s hope when this miserable recession ends, that the Portuguese government will be able to invest in its treasures like historic Braga and the magnificent Bom Jesus.